You may have heard of the health benefits of resveratrol on humans, or you may have already started taking the supplement. 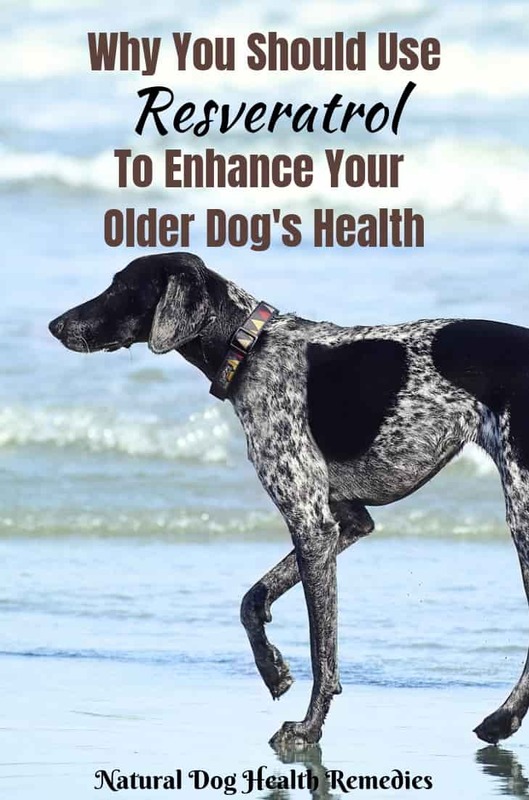 But did you know that resveratrol is also good for our dogs, especially for senior dogs? Resveratrol is a type of natural polyphenol called a phytoalexin. It is produced by certain plants as part of the plants' defense system against disease, such as fungal infections, stress, and ultraviolet irradiation. Resveratrol can be found in red wine and in about 70 different plant varieties including grapes, pomegranates, raspberries, peanuts, and Japanese knotweed. Since polyphenols are antioxidants, like any other antioxidants, resveratrol has anti-inflammatory as well as anti-cancer properties. Clinical studies on resveratrol benefits have primarily been conducted on laboratory animals. Although research on humans is still in its early stages, the results are very promising. Current research into resveratrol benefits shows that resveratrol having amazing anti-aging properties. Resveratrol seems to be able to stimulate the SIRT1 gene, which seems to help slow down the aging process. Additional resveratrol benefits include cancer fighting and weight loss. 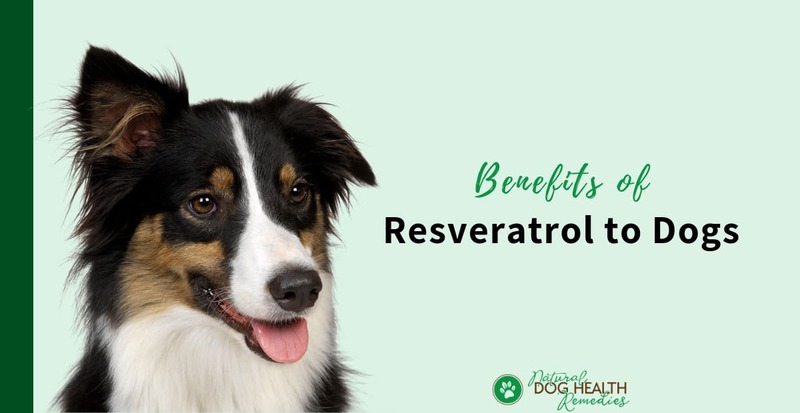 Although research on resveratrol for dogs is still very much limited, given the fact that resveratrol is an antioxidant and the positive clinical study results on lab animals, we may assume that resveratrol is beneficial to dogs as well. In particular, resveratrol can likely promote longevity and control weight in dogs. However, perhaps the most exciting thing about resveratrol for dogs is its potential ability to prevent and slow down cancer growth in dogs, due to its anti-inflammatory and anti-cancer properties. According to the National Cancer Institute, resveratrol has been shown to reduce tumor growth in animals by affecting one or more stages of cancer development. It seems to be able to inhibit cancer cell growth and metastasis. To quote Dr. Robert Sclafani, the Chair of Biochemistry and Molecular Biology Department at CU Denver, "There's no doubt, if you feed an animal this stuff, they're going to get less cancer." Anecdotally, dog parents who have started giving resveratrol supplements to their dogs have reported that their dogs are leaner, more alert, and have more energy. Some dog parents supplement their older dogs with resveratrol for cancer prevention. There are also anecdotal reports by dog parents that resveratrol actually has slowed down or even stopped the growth of cancer in their dogs. Since many resveratrol supplements are made from grape extracts, and since grapes are poisonous to dogs, you may wonder if resveratrol is safe for dogs. I cannot find any research on the toxicity of resveratrol in dogs, and am not entirely sure whether it is safe if a resveratrol supplement made from grape extract is given to dogs on a regular basis. However, the good news is, resveratrol can be obtained from plants other than grapes! And if you get a supplement that sources its resveratrol from a different plant that is safe for dogs, there should not be a problem. As regards possible side effects, again, no clinical research showing adverse side effects of resveratrol on dogs has been found. In a toxicology study of resveratrol, rats given up to 300 mg/kg of body weight showed no side effects, but at higher doses they showed adverse effects such as clinically significant kidney problems, dehydration, anemia, and acute pelvic inflammation. Anecdotally, dog parents giving small doses of resveratrol (suggested dosages: 5-7 mg per 30 lb of body weight) have reported very positive results with no side effects. This supplement contains resveratrol sourced from Japanese knotweed, as well as several other good supplements including kelp, flaxseed oil, and lecithin to synergistically address a wide range of health needs of our dogs, such as imune system support, cancer prevention, and promotion of heart, skin, joint, and brain health. Did you know that dogs should be detoxed regularly?